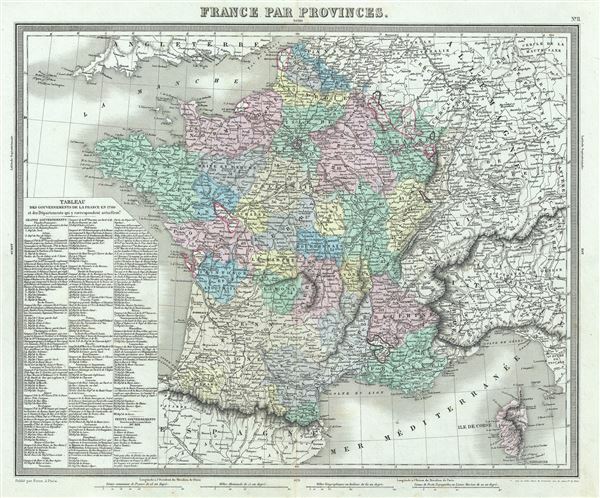 This is a lovely example of the 1874 map of France by Ambroise Tardieu. The map covers the Kingdom of France showing its various divisions according to province. It covers from the Flanders in the north to Roussillon in the south and from Brittany in the west to Alsace in the east. An inset map on the lower right corner details Corsica. Throughout, the map identifies various cities, towns, rivers, lakes, roadways, railways and an assortment of additional topographical details. France was organized into provinces until March 4, 1790, when the National Constituent Assembly reorganized the Provinces into Departments. The change was an attempt to eradicate local loyalties based on feudal ownership of land and focus all loyalty on the central government in Paris. There were roughly 40 provinces in France before they were abolished. Nonetheless, the province system was so engrained that most cartographers felt obliged to include two maps of France in their atlases, one showing the current department system, and another defining the defunct provinces. This map was prepared by Ambroise Tardieu and issued as plate 11 in his 1874 edition of Atlas Universel de Geographie Ancienne et Moderne.